About 12 years ago, I was a communications consultant for one of Europe’s largest urban regeneration projects in what is known as Amsterdam Nieuw West, a series of post-war neighbourhoods with a bad reputation. Every day while travelling to work, I passed a neighbourhood called Lelylaan. At the neighbourhood’s entrance, a sign declared, in large steel letters: ‘Lelylaan Leeft!’ (which can be translated as ‘Lelylaan is Alive’ or ‘Lelylaan is Lively!’). The slogan was somewhat cynical, albeit unintentionally so, because it described the area around it so badly. It was located right next to Station Lelylaan: a dreary location, not lively at all, but rather a place you’d want to leave as soon as possible. The railway station was blocked by large fences most of the time, police and private security patrolled the area almost continuously and, if they didn’t, junkies and dealers haunted it. Thus, the sign had an almost Soviet absurdity to it, stemming, it seemed, from the belief that simply declaring the neighbourhood lively would make it so. Both this sign and the urban regeneration project I worked on are what Sander Bax, Pascal Gielen and Bram Ieven, editors of Interrupting the City: Artistic Constitutions of the Public Sphere, would call interruptions of urban reality. Such interruptions, they explain in their introduction, are events that intervene in ‘the flow of the social, media and economic forces that make up the public sphere’ (14). Out of such interruptions may come a realignment of these forces and therefore a new constitution of the public sphere. One is reminded here of John Dewey’s description of how a public emerges: it is the very wish to regulate and, in some cases, to control human action by the state that constitutes the public (Dewey, 1927: 15-16). Every attempt to regulate human action is an interruption that brings about what one could call a new type of public. The sign in Lelylaan and the urban regeneration of which it was a part are very much a topdown interruption, an attempt to bring about a very specific new public sphere, that can be characterised as gentrification. Art could be such an interruption as well, the editors argue, as it also has this capacity to transform and reimagine the public sphere. However, the sign in Lelylaan is merely the transmission by the state of the desired public space, whereas art, as the editors put it, ‘is always a representation of reality […] that quickly becomes a comment or critique on that reality’ (20). Artwork invites people to respond, through play, to the alternative public space it proposes and is therefore much more bottom up. One could also say, as Erik Swyngedouw does in his contribution to this volume, that art offers the possibility of insurgence, often directed exactly against the top-down transmission of ‘being a public’ that is exemplified by the sign in Lelylaan. As the facilitator of play, art directly intervenes in today’s cities and their otherwise highly commodified public spheres. If the ‘creative city’ propagated by Richard Florida and his ilk commodifies the inborn human tendency to play, art provides spaces for play that are not made useful and valuable, for play that stands outside the reach of neoliberal capitalism. In other words, art constitutes an alternative public sphere by providing the opportunity to be unproductive and by helping people imagine alternative ways of being a public. This active resistance to neoliberalism and analysis of such resistance in the world of art is characteristic of the Antennae series, of which Interrupting the City is the twentieth instalment. Like most other volumes in this series, it offers an enticing mix of academic analysis, interviews with artists and thinkers, and contributions by artists reflecting about their artistic practice. As the introduction to another volume in the series explains, the idea is ‘to gently orchestrate a polyphonic conversation in which the singular voices of individual artists discussing their own creative practices are equally important as the more scholarly contributions’ (Cools & Gielen, 2014: 10). The result is almost always food for thought, with more space for essayistic approaches than in regular academic publications. All this gives the series the feel of a cross between an academic journal and an art magazine. Indeed, considering the frequency with which new volumes in the series appear (more than 20 in 10 years’ time), one could wonder why it doesn’t take the shape of a periodical, richly illustrated and distributed widely, so it could reach a larger audience. Here, as in many other volumes in the series, the enemy is neoliberalism. Art and creativity are pitted against it as agents of change, obstructive interventions in the oiled radar work of the smoothly running neoliberal machine, but also under threat of being commodified themselves. One may take issue with such a partisan approach, which always runs the risk of saying ‘art is’ when really meaning ‘art should be’, or discarding art that doesn’t fulfil this lofty task as ‘not real art’ (à la Adorno). However, it is this willingness to take sides that gives this series its unique flavour and critical edge, addressing an interested and intelligent reader who could, of course, always disagree. The series in general and this volume in particular are thus themselves interruptions, aiming to constitute a public sphere through their polyphonic approach (with polyphony itself already a counterweight to neoliberalism’s tendency to standardise). It is significant that this volume is the first in the series in which literature plays a certain role. Before, the focus of the Antennae series was on the visual and performing arts. This probably has to do with the fact that two of its editors – Bram Ieven and Sander Bax – are specialists in Dutch literature. In any case, one can applaud this broadening of scope and hope that this trend continues. At first it may seem slightly surprising that literature is given such a central role in a volume about the public sphere. Thinking about interruptions of the public sphere brings to mind more physical interventions, such as Rafael Lozano-Hemmer’s installations, which entice their audience to enter into solitary or communal play with light and shadow in public spaces. Literature seems almost to be at the other end of the scale when it comes to the ability to have an immediate impact on urban realities. However, the editors – referring to Jürgen Habermas’s classic essay, The Structural Transformation of the Public Sphere – remind us that the literary public sphere in many ways paved the way for the public sphere of modern times, providing ‘a training ground for a critical public reflection still preoccupied with itself’ (15). As the essays in this volume show, literature has lost none of that quality. Sander Bax writes about the interrelatedness of Joris Luyendijk’s banking blog and Tom Lanoye’s novel Gelukkige slaven. And Odile Heynders places a wonderful close reading of Italo Calvino’s Invisible Cities alongside expats’ descriptions of their experiences of European cities, reminding us that, in the words of Calvino, ‘the city must never be confused with the words that describe it’ (a warning that those who placed that sign in Lelylaan should have taken to heart). Vanessa Joosten’s contribution about Bart Moeyaert’s 2006 and 2007 stint as Antwerp’s Poet Laureate shows what happens when a poet gets caught between top-down and bottom-up attempts to regulate and control the constitution of a public. She illustrates how the institution of City Poet has a fundamentally schizophrenic nature, incorporating both the transmission of ‘being a public’ by the state and the artistic intervention in that very transmission by the individual artist. The other contributions to this volume offer equally rich reflections on other art forms, either analysing the interruption of the public sphere and the possible publics these interruptions may constitute, or functioning as such interruptions themselves. Tessa Overbeek is present – as she is in several other volumes in the Antennae series – with a thought-provoking piece on circuses. She interviews veteran New York circus performer Jennifer Miller, who presents circus as the artistic interruption of the public sphere par excellence. Indeed, is there any more titillating intervention in the urban public sphere than the circus coming to town? That event, probably in some form or another as old as the city itself, may be more successful than any other in teasing out the demarcations of urbanity itself, when a nomadic troupe of performers invades the sedateness of the settled. Similar interruptions are presented in other contributions. These range from the performance art of Rennie Tang and Sara Wookey, in which everyday urban actions are used in a choreography that then interrupts those very actions in the public sphere, to installations by Sarah Vanhee that transmit the screams of those who are normally kept out of the public sphere: prisoners. Not blind to the pitfall of presenting art as a utopian practice that will correct all the wrongs of the modern cityscape, the volume also republishes a harrowing 2005 essay by Gregory Sholette. It describes his dawning realisation that in the neoliberal city’s celebration of the creative class, art and artists have become the unwitting but willing allies of gentrification; Lelylaan Leeft! in a fancy dress, one could say. In the final essay of the volume, Pascal Gielen offers a way out of this commodification of art and creativity when he suggests that the creative city is only one stage in the evolution of urbanity. He predicts that it will be replaced by the common city, in which ‘the neo-tribal crowd becomes political’ (295). In such a city, art will leave the museums and theatres to be like the circus coming to town: interrupting any hegemony so that the city always remains in a constant (Deleuzian) process of becoming. It will therefore be fundamentally open to everyone, unlike the gentrified urban sphere of the creative city, which is fundamentally exclusive. With that idea, the volume ends on a utopian but utterly enticing note, promising a city that is truly alive and lively, rather than merely described as such. Sander Bax, Pascal Gielen en Bram Ieven (eds. ), Interrupting the City: Artistic Constitutions of the Public Sphere. Utrecht: Samenwerkende Uitgevers vof, 2015. 288 pp. isbn: 9492095025. € 19,90. Cools & Gielen 2014 – G. Cools & P. Gielen (eds. ), The Ethics of Art. Ecological Turns in the Performing Arts. Amsterdam, 2014. Dewey 1927 – J. Dewey, The Public And Its Problems. Denver, 1927. Met het verschijnen van de nieuwe editie van het volledige Gruuthuse-handschrift, een verzamelhandschrift dat zijn belang ontleent aan het feit dat het toelaat een blik te werpen op het literaire leven in Brugge rond 1400, is een van de belangrijkste desiderata binnen de medioneerlandistiek ingewilligd. Deze kritische editie, verzorgd door Herman Brinkman met medewerking van de musicologe Ike de Loos, is een monumentaal boek in twee banden geworden, en een waardige afsluiter – na zijn diplomatische edities van de andere twee kleppers uit de medioneerlandistiek: het Comburgse handschrift (1997) en het handschrift-Van Hulthem (1999) – van de ‘Brinkman-trilogie’. De eerste band (869 pagina’s) bevat de eigenlijke editie, voorafgegaan door een uitgebreide inleiding, en de tweede band (488 pagina’s) de commentaren en aantekeningen bij de editie en de registers. In het ‘Woord vooraf’ opent de eerste band met een boeiend relaas over de totstandkoming van de editie. Het blijkt een project van lange adem geweest te zijn waarin meerdere tegenslagen verwerkt moesten worden – niet het minst het overlijden van twee musicologen die erbij betrokken waren: Kees Vellekoop (2002) en Ike de Loos (2010). De verwerving van de codex door de Koninklijke Bibliotheek in Den Haag in 2007 bracht het project ten slotte in een stroomversnelling en vooruitlopend op de kritische editie werd in dat jaar al een webeditie gepresenteerd (bestaand uit het gedigitaliseerde handschrift en een diplomatische transcriptie), zodat ook het brede publiek kennis kon maken met dit opmerkelijke handschrift. De 211 pagina’s tellende ‘Inleiding’ bij deze editie is met grote voorsprong de uitvoerigste die in een van de delen van de reeks Middeleeuwse Verzamelhandschriften uit de Nederlanden (mvn) voorkomt. In de eerste paragraaf wordt een verkennende beschrijving gepresenteerd door het handschrift achtereenvolgens vanuit verschillende invalshoeken te bekijken: de genres, de thematiek, de poëtica, en de dichtvormen en de melodieën worden ter sprake gebracht. De tweede paragraaf behandelt uitvoerig de geschiedenis van het onderzoek naar het Gruuthuse-handschrift, terwijl de derde paragraaf de codex als materieel object beschrijft. In deze codicologische beschrijving heeft Brinkman, zoals we van hem gewend zijn, oog voor de kleinste details. Op pagina 117 vat hij uiteindelijk zijn bevindingen bondig samen, waarna hij tot slot van deze paragraaf het wapenschild van Lodewijk van Gruuthuse bespreekt. 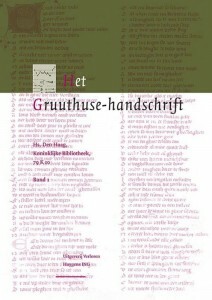 Paragraaf 4 behandelt vervolgens de taalkundige aspecten van het handschrift, paragraaf 5 richt zich op de structuur van het liedboek en in paragraaf 6 worden ruim zestig pagina’s besteed aan een schets van de sociale context van het handschrift. Op basis van archiefonderzoek presenteert Brinkman hier een voor de medioneerlandistiek ongekend panorama. Het vraagt minstens twee lezingen om alles te vatten, maar het literaire leven in het Brugge van Jan van Hulst en Jan Moritoen rond 1400 wordt vakkundig van kleur voorzien. De ‘Inleiding’ wordt ten slotte besloten met een overzicht van de inhoud. Het tweede luik van de eerste band is de eigenlijke editie. Na een korte verantwoording van de gemaakte keuzes volgt een keurig verzorgde editie die voorzien is van uitvoerige woordverklaringen onderaan de pagina’s. In tegenstelling tot de andere diplomatische en kritische edities in de mvn-reeks, die vooral voor vakgenoten en studenten bestemd waren, is bij deze editie gestreefd de tekst ‘ook toegankelijk te maken voor een geïnteresseerd, maar niet noodzakelijk wetenschappelijk geschoold lezerspubliek’ (p. 228). De wetenschapper – die ongetwijfeld de woordverklaringen eveneens toejuicht – mag zijn hart ophalen in de tweede band. Hier treft hij bijna 400 pagina’s commentaren en aantekeningen aan. In de commentaren wordt elke tekst in de codex geparafraseerd en toegelicht. Daarnaast worden alle teksten voorzien van een overzicht van de eerder verschenen edities en verwijzingen naar publicaties waarin ze besproken zijn. De aantekeningen, ten slotte, geven bij elke tekst een uitgebreid overzicht van tekstkritische ingrepen, paleografische opmerkingen en eventuele variante lezingen in de paralleloverlevering of musicologische opmerkingen. Dit is het soort totaaleditie dat elk handschrift verdient – als we maar voldoende tijd en geld hadden. Toch heb ik enkele kanttekeningen bij dit eindresultaat: over de codicologische beschrijving en over de afbeeldingen. Deze laatste kanttekening is de kortste: waar zijn de afbeeldingen? Hoewel ik de url van de webeditie enkel in het overzicht van digitale bronnen heb kunnen vinden (dl. ii, p. 450), neem ik aan dat het bestaan van het digitale bladerboek van doorslaggevende betekenis was bij de keuze het aantal afbeeldingen in de editie tot een minimum te beperken. Dit is ontegensprekelijk het grootste gemis van deze prachtige editie. Een magere vijftien afbeeldingen van de codex sieren beide volumes, waarvan slechts één afbeelding een volledig blad weergeeft (afb. 12 in dl. ii, p. 2). Terwijl in de eerdere edities uit de mvn-reeks werd gestreefd naar een zo groot mogelijk aantal afbeeldingen, wordt nu onverwacht van dit uitgangspunt afgeweken. Mijn kanttekeningen bij de codicologische beschrijving van het handschrift zijn gerelateerd aan de status van de edities in de mvn-reeks. De codicologische beschrijvingen van de geëditeerde handschriften in deze reeks zullen de komende decennia als de standaardbeschrijving van de codices worden beschouwd. Er mogen daarom hoge eisen aan worden gesteld. De beschrijving van de onderhavige editie blijkt echter niet overal nauwkeurig genoeg te zijn. Om te beginnen beschrijft Brinkman het Gruuthuse-handschrift als een codex die bestaat uit drie codicologische eenheden. Een codicologische eenheid is, volgens Peter Gumbert, die in 2004 deze term ijkte: een bundel katernen die ‘in één operatie’ is bewerkt en beschreven en die ‘een afgeronde tekst of tekstreeks’ bevat en die onafhankelijk van de andere eenheden in een codex kan circuleren. Bekeken vanuit de inhoud van de codex of vanuit een pragmatische visie is voor Brinkmans driedeling zeker wat te zeggen, maar een codicologisch iets verfijndere aanpak was hier op zijn plaats geweest. Er is immers geen sprake van een driedeling die samenvalt met de traditionele, generische onderverdeling in gebedendeel (I), liedboek (II) en gedichtendeel (III), maar van vijf verschillende eenheden (en waarschijnlijk ooit zelfs zes). Dat de codex in de huidige samenstelling uit meer dan drie eenheden bestaat, blijkt het duidelijkst in het gedichtendeel. Dit deel bestaat uit een eenheid van twee katernen, gekopieerd door hand A, waarin slechts één tekst voorkomt (III.1) en een verlengde eenheid die begonnen was door hand C en voortgezet door hand B. Volgens een later aangebrachte nummering, die een selectie gedichten markeerde, is de kans bovendien groot dat tussen deze twee eenheden nog een derde, nu verloren eenheid heeft gezeten. Dat ook hier sprake is van een eenheid, gekopieerd door een niet nader te bepalen kopiist, blijkt uit het feit dat de teksten erin niet begonnen of doorliepen op de aangrenzende eenheden. Het gebedendeel, ten slotte, bestaat eveneens uit twee eenheden (één gekopieerd door hand A en één door hand B). Hoewel ze in elkaar zijn geschoven en nu samen één katern vormen, zijn ze op geen enkele manier van elkaar afhankelijk. Ze hadden evengoed achter elkaar ingebonden kunnen worden. Een benadering van het Gruuthuse-handschrift als een codex die nu uit vijf – en waarschijnlijk ooit uit minstens zes – codicologische eenheden bestaat, hoeft niet noodzakelijk tot andere uitkomsten te leiden dan het onderzoek van Brinkman. Hij bespreekt alle vijf (zes) eenheden immers binnen zijn driedeling. Wat het wel oplevert, is meer nadruk op de gelaagdheid van het productieproces en op het doel waarvoor de afzonderlijke lagen gemaakt kunnen zijn. Nu wordt vooral de continuïteit van het productieproces benadrukt – zo wordt op p. 117 gesproken van ‘de langgerekte productiefase van de codex’. Deze omschrijving doet vermoeden dat er min of meer onafgebroken over een langere tijd aan de codex is gewerkt en dat hij moest worden zoals hij nu is. Maar over de ‘codex’ die A maakte voordat B hem aanpaste, weten we niets. We moeten daarom rekening houden met (minstens) twee aparte productiefasen: die van A en die van B. In de codicologische beschrijving komen nog enkele opmerkingen voor die net iets scherper geformuleerd hadden mogen worden. Op pagina 107 wordt bijvoorbeeld beweerd dat de mineurstemming van de laatste liederen die hand A in het liedboek kopieerde de reden kan zijn waarom er later nog andere, vrolijkere liederen achter werden toegevoegd. Deze stelling impliceert dat bekend is hoe het handschrift gebruikt werd: dat de liederen van voor naar achter werden doorgelezen. Hiervoor zijn echter geen aanwijzingen te vinden in de codex. Vergelijkbaar is de uitspraak op pagina 108 dat hand C, van wie slechts één tekst in de codex voorkomt (III.2), mogelijk vanwege zijn slordigheid zijn kopieerwerk moest staken. Dit vermoeden wordt door Brinkman nergens toegelicht, maar impliceert dat C werd ontslagen door een op dat moment in de codicologische beschrijving onbekende opdrachtgever. Pas op pagina 117 wordt de mogelijke rol van hand B als opdrachtgever besproken. We weten echter niets over de verhouding tussen B en C, noch hoe B aan het werk van C kwam, noch of dat veel fouten maken een gebruikelijke reden was om aan een kopiist te vragen zijn werk te staken. Ten slotte bevat de codicologische beschrijving een aantal kleine foutjes die tijdens de eindredactie over het hoofd zijn gezien. Zo wordt in tabel 4 (p. 82-83) vermeld dat hand Z van tekst III.16 vers 543-601 heeft geschreven, terwijl zijn bijdrage aan die tekst al in vers 143 begint. Daarnaast staat op pagina 69 geschreven dat tekst III.1 in twee katernen is gekopieerd, die f. 39-58 beslaan, hoewel in de tabel erboven (nr. 2) getoond is dat het om f. 39-42 en f. 51-58 gaat, omdat het tussenliggende katern (f. 43-50) op de verkeerde plaats is ingebonden. Vervolgens klopt de informatie in noot 219 niet, want f. 68vb-69rb zijn namelijk wel gerubriceerd. Tot slot bevat ook het kopje boven ‘Fase 4’ in paragraaf 3.9 een fout: in deze fase zouden de eerste uitbreidingen van hand B in het gedichtendeel en het gebedendeel worden besproken, maar over dit laatste deel staat hier geen informatie. Die treffen we wel aan bij ‘Fase 2’. Mijns inziens kan deze tweede fase beter bij de vierde fase gevoegd worden, omdat er geen argumenten worden gegeven waarom B eerst aan het gebedendeel en pas daarna aan het gedichtendeel gewerkt zou hebben. Ondanks deze kanttekeningen bij de codicologische beschrijving zijn de scherpe observaties van de editeur en zijn prestatie het kluwen informatie dat ze hebben opgeleverd te ontwarren, niet minder dan bewonderenswaardig te noemen. De editeur verdient alle lof, want zijn jarenlange engagement voor deze onderneming van enorme omvang heeft geresulteerd in een vernieuwende kritische editie van het Gruuthuse-handschrift die de basis zal vormen voor een voortgezette discussie over de codex op een hoger niveau.